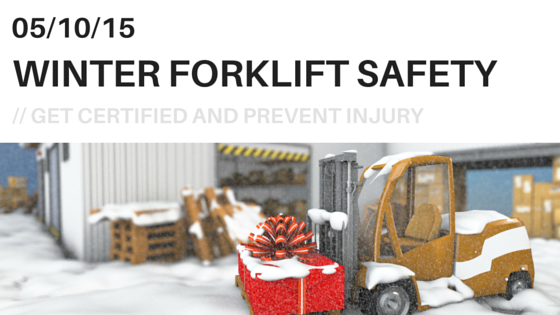 Operating a forklift in the winter can be quite tricky, and it presents dangerous situations every day on the job. Slick, icy roads, and below-freezing snow blizzards put forklift skills to the test. According to the Occupational Safety and Health Administration (OSHA), approximately 12 fatalities happen each day to forklift operators in the U.S., all from accidents and injuries that are preventable with the right training. When operating a forklift, drivers need to be aware of the slippery surfaces, being careful not to rush to complete a load. Situations like this can cause severe injury and even death if the forklift collides with another object or lift, or causes the driver to fly from their seat. Also, injury from falling snow can cause hypothermia and other related injuries if workers are not dressed properly for the elements. How Can You Prevent Injury And Deaths This Winter? OSHA recommends workers keep all walking paths clear of snow and ice this winter, and to spread de-icing products as soon as possible after a storm. Wearing well-insulated, waterproof footwear with excellent traction and grip to prevent slips and to keep your feet warm. Taking careful, short steps, and walking at a slower pace than usual. Wearing warm clothes like polypropylene underwear to trap body heat. Wearing bright colors, or adding reflective tape to your outdoor clothing so other forklift operators can see you during a snow storm when visibility is limited. Taking regular breaks for workers to regain focus. What Winter Safety Protocols Does OSHA Look For? In addition to the safety protocols listed above, OSHA looks for proper forklift covers made with high-quality materials. This cover is used to shield lift operators from precipitation. Workers need to purchase a transparent cover that does not block their view when operating forklifts during snow flurries. Also, one that is designed to drain rainwater from the roof using specially designed ribs and gutters so that water does not spill in front of you every time you hit the brakes. Although accidents can happen anywhere, severe injuries and fatalities can be greatly reduced this winter with the proper employee training. Not to mention, expensive fines issued by OSHA for in compliance. Forklift certification that is OSHA compliant will teach workers how to operate forklifts, what safety hazards to look out for, and how to inspect equipment and the environment for any red flags. Training through CertifyMe.net can be completed in as little as one hour, online during a lunch break or at home, and will give forklift workers the skills they need to operate forklifts and perform duties as safely as possible this winter.